He was born on April the 20th in 1964, Alibayramli city. In 1981, he finished secondary school no 14 there. He was discharged from Military service of Baltic Troops in 1984 and entered Kaunas School of Warrant Officers. When he graduated from the School of Officers, he was sent as a young officer to a military unit near Kutaisi. He had to continue his service in Afghanistan since 1986. In one of the battles, he was wounded but continues to serve after the recovery. He was awarded a lot of medals and Diloma for his bravery. He retrned to Baki in 1988, and Garabagh conflict was just beginning by then. In 1991, the Azerbaijan Republic declared its independence. And Rafael Habibov was one of the first officers to join the National Army that was newly created in 1992. Rafael Habibov was sent to Karabakh combat zones on 23 may 1992 with the rank of lieutenant. He was actively involved in the battles for the sake of the villages such as; Tezekend, Narıshtar, Zod, Ala Qaya, Cherektar, Aghdaban, Chapar. He along with his team destroyed the enemy’s Heavy Infantry Vehicle 24 (IVH24) along with its crew in the battles for Kalbajar. Despite being wounded, the brave lieutenant, entered the fight again. Thanks to his courage, many Patriotic sons of the country were rescued from the clutches of death. July the 7th, 1992, was Habibov Rafael’s last battle. 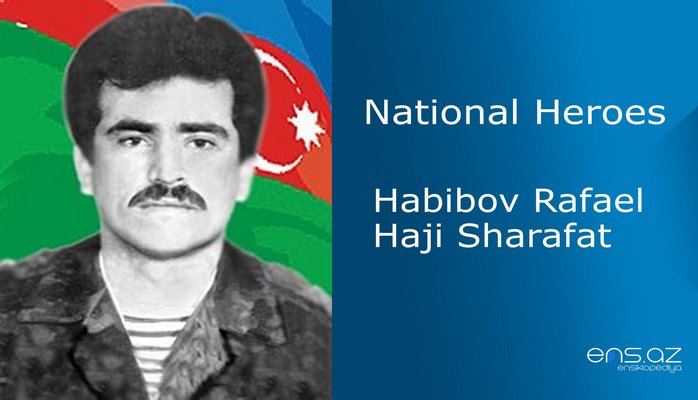 Lieutenant Habibov Rafael Haji Sharafat was posthumously awarded the title of "National Hero of Azerbaijan" by the decree # 202of the president of the Republic of Azerbaijan on 16th of September, 1994. He was buried at the cemetery in the city of Alibayramli. High School # 14 where he studied is named after the hero. And there is also a bust of him in the school as well.